Struggling for party activity ideas? Forget pampering sessions and drinking games. If you really want to make your party one to remember, sushi-making is the way to do it. 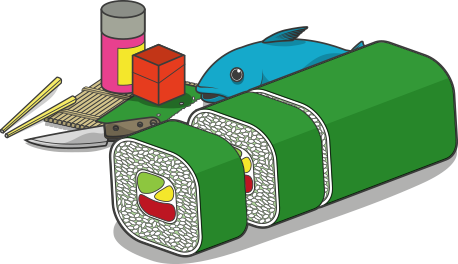 A popular choice of activity for Hen nights and team-building events, social sushi-making is a fun, messy, and rewarding activity that encourages creativity. And, it doesn’t have to be expensive if the costs are divided among friends! Comprising six, professional quality, flexible mats, our Square Bamboo Rolling Mat Set is an inexpensive option for sushi party and cooking course hosts. Each is made of the finest quality, flat-sided bamboo strips, held together in the traditional style with water-resistant, waxed cotton tethering. Measuring 9.5 inches (24 cm) square, their ample size makes them ideal for both small and large projects – including Futomaki. If you’re planning a sushi-making get-together, bamboo rolling mats are one of those essential basic tools you just can’t afford to do without. For starters, not everyone will be of the same capability, therefore might need a little assistance to master the art of manual rolling. Secondly, using a bamboo rolling mat achieves far more uniform results!